First, let us start by saying that Jump Send runs Promotions by each individual ASIN so the system does not allow shoppers to request your product more than once, whether they were approved or not. This is to ensure buyers cannot request the same ASIN twice or abuse the system. But, it's also important to note that if you run different promotions for multiple variations, then shoppers can request one code for each of those individually promoted variations since they all have different ASINs. Create a different promotion for each variation you want to promote (we recommend this!). Promote just one of your product's variations, adding codes that can be used on any child ASIN. We have to caution you about issuing codes that work for any variations at the same time! Because buyers can get any number of units from you with a single discount code. This is why we came up with the Inventory Protection feature BUT when you add this protection to a promotion, it will only work on the main ASIN linked to the discount in Jump Send. That means only that particular variation will be protected and all the other ones are at risk (unless you change the quantity manually on the listing directly). If you understand the risk of listing a Promotion with codes that work on multiple variations, you can indeed issue a batch of coupons that will work on any of the variations for the parent ASIN...however, if you go this route, we STRONGLY recommend restricting each ASIN manually! 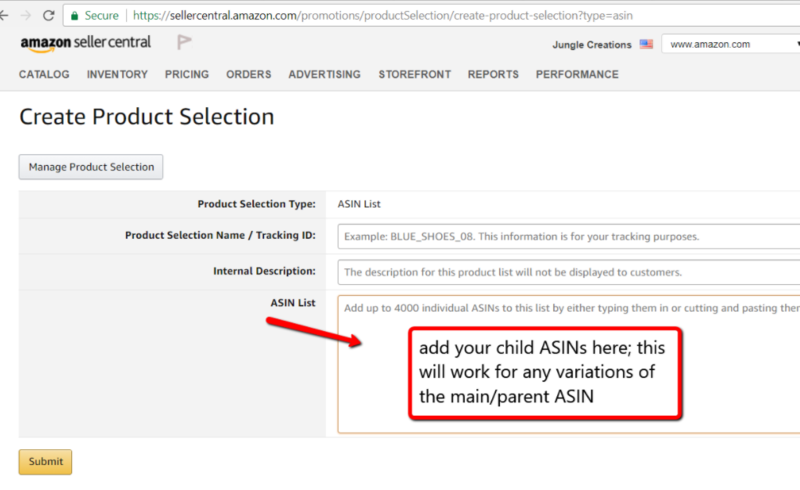 To issue coupon codes that will work for all of your ASIN's variations, add all of the individual child ASINs on the 'ASIN List' box when creating your codes and then click Submit. That way the codes issued will work on any variation or size of your product, as long as they all share the same price. That should set a limit on the number of products that a Buyer can purchase for each variation...which is why we suggest you set the Max Order quantity to '1' during your promotion. While it's true that your full-price Amazon buyers will also be subject to this limit per order, we believe it's more important to protect your inventory when you have percentage-off discount codes out there for your promotion.